The Voice of Clan Jin’Sorai is fit to give me nightmares. 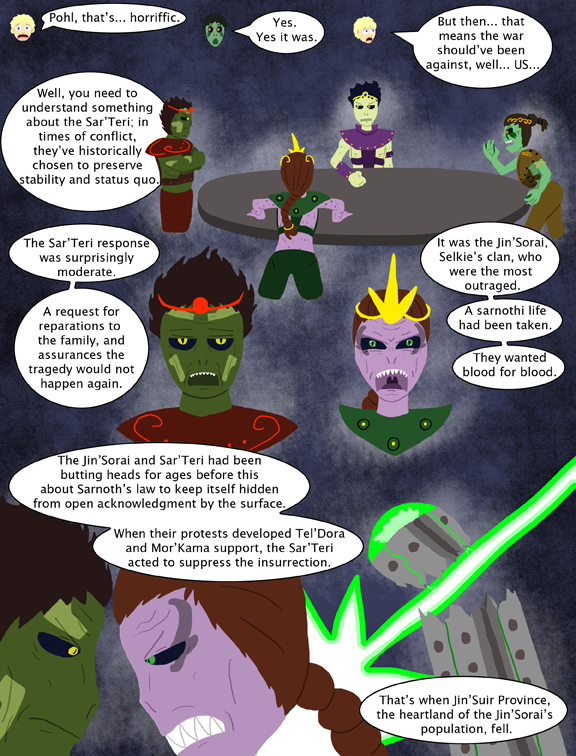 At the round table you can see the Voice (a leadership position which leads in-Clan matters) of the Mor'Kama, Tel'Dora, Jin'Sorai, and Sar'Teri (clockwise from top). Jin'Sorai and Mor'Kama are easiest to tell apart; Jin'Sorai are generally light blues and violet skin tones, and have a tendency for green eyes. Mor'Kama are pale greeny-yellow with coal-black hair, and do not develop body markings. Tel'Dora and Sar'Teri can look similar at a glance, but Sar'Teri generally have darker forest-green or olive-green skin tones; their markings are lighter in tone than the rest of their skin, and develop in geometric tendencies. Tel'Dora are a light green-gray to aqua and have stripe-patterned markings. Ooooh! The plot thickens. Unlike Selkie, I like history, and this actually makes sense… If the other clans were acting to suppress Jin’Sorai from acting, and then things escalated out of control… My brain is suddenly filled with lots of possibilities and they are all interesting. Also, the voice of Jin’Sorai is fit to give me nightmares, but she also reminds me of some teachers I have had. Still. Scary. Um. So does this mean Selkie’s occasional outbursts (like when she tried to attack Truck’s father) are … genetic … somehow? I suppose it’s not realistic to expect a voice of reason from the clan devoted to the arts… Congratulations, Dave, you’ve made me look forward to Mondays. What kind of weregeld were they going to ask for? Curious as to the value they placed on him. sooooo…… basicaly the sar’teri are not part of the council for a republic city state but rather its dictator and overlord. they saw the current system of law way about to be replaces and swiftly killed what im guessing is a near 1/4th of the sarnothi population to scare the remainig peoples into submission. they are the worst kind of people possible and i hope the US decides to take action against them we do have the tech and even if the comic takes place even as far back as the early 2000’s we ould destroy the sar’teri for their actions against those whose right to life has been violated. Yeah, but that’d result in genocide. If you put the absolute worst, cowardly, corrupt, scummiest, gung-ho, racist, warmongering U.S. and Canadian politicians in all of history in a room and proposed that plan to them, they’d all unanimously balk at the idea of committing genocide. At the very least, it would utterly destroy their civilization leading to chaos and even more innocents’ deaths. The reason why the U.S. tends to ignore the wars of others as long as their allies or own territory is untouched, even if there’s genocide going on, is because fixing the problem by wiping out the offending government often means killing even more people than are being killed already. This is the real reason why the Cold War was cold, above and beyond the still-theoretical Mutually Assured Destruction of atomic war. Otherwise the U.S. would have invaded Russia the minute the Pogroms started, and history would have been really different. The pograms happened under Tsarist Russia, in the 18th and 19th centuries. This was well before the U.S. had a powerful military, and we probably wouldn’t have been able to do anything to Russia, even if we had wanted to. I’m not even sure if the U. S. existed “the moment the pograms started”. its the exact thing we did in iraq and its what we were threatining to do i lybia so why not the sar’teri? this is just what the US does and in my personal oppion of this fictional world based off my own real life projections the US would want to get involved especially due to the fact that it is within what they concider to be their borders. I know you’re saying that disparagingly, but it is actually part of official US policy not to invade a country if we don’t have something for us at stake, and it’s actually not for selfish reasons. It’s to prevent us from getting too gung-ho and rampaging around the world sticking our noses in business that doesn’t belong to us and making things worse in the process. :/ Politics is more complicated than you think, okay? There is something else to consider; the Sarnothi city state is vast, and they’re a populous nation, but they’re fresh-water, and as far as we know limited to one single lake system. Surrounded on all sides by an industrialised, somewhat xenophobic and occasionally belligerent continental superpower. Sarnothi technology may well be superior (from what we’ve seen), but just how long would they last if their lake was poisoned? The children and adults can live on land, but their babies (eggs)? Fish-tanks do not make for a safe or secure species – on land they absolutely depend on an industrial economy with guaranteed clean water. The Sar’Teri may have been terrified that retaliations against the surface would have added one more species to the list of extinctions that humans have achieved. That doesn’t make what they did right, but if the choice was civil war or extinction, which would each one of us choose? you do make a good point. yet given the choices they had especially if they were as technologically advanced as we all seem to surmise, the diplomatic approach would have a significantly higher chance of everyone getting out alive rather than only what little the sar’teri decide are fit to live. given the americans history of dealing with natives on what they concider to be their land, (I.E. native americans and the trail of tears.) id say they would do alright as they basically are in a confined area akin to reservations and the united states could just grant the sar nothians the same anemities as any of the native american tribes. this could be a neigh on fool proof solution. now this is still not taking into account human prejudice or fear of the unknown. but id say it still has a better chance of sucess than what the sat’ teri are doing. Wait, are you ADVOCATING this?!?! Welp, at least we can’t blame it all on humans. Or all on the Sar’Teri, for that matter. The Sarnothi really are just like us – they have their differing factions, each one with its own inherent stupidity. Gosh floobit Dave! Why can’t you give us a clear villain?! …Wait, it’s because you’re such a good writer. Darn. And wait … am I the only one here who thinks the Sar’Teri leader/representative/whatever looks disturbingly like Theo? The Voices wear some neat outfits. Fancier than the clothes Selkie and her mom used to wear but likewise cut to leave the gills clear. They do use the green magic for weaponry, and it’s strong enough to destroy buildings. When is Selkie going to learn to use the green magic, I wonder? I bet Sai Fen could teach her. She probably knows when the standard age is, too. I would guess, though, that Todd will have a strict “no practicing in the house” policy until she’s able to control it really well. I suspect accidentally blasting the roof off the apartment building would result in a rather large spike of Todd’s rent. Or Selkie gets a small stone to practice with and takes it to school to show off what she learned. Truck or someone shoves her and she yells at them in anger and accidently cuts them or severs a limb or something. It’s amazing how war can start. Could you image if a war with the U.S did spark out of that..
Wow I never thought of that but your right. I can see why the government tried so hard to cover it up. Well the plot thickens. I’d have to say though this is becoming wonderfully non-straightforward plot wise. Sure the Sar Teri attacking their own people is extreme in the greatest sense but their initial reaction to the tragedy shows they aren’t a black and white 2dimentinal “evil” group. Still ill keep my judgements on individuals not groups for now. You know how out of hand that can get. I have to say while I don’t agree with them killing off their own people, that the Sar’Teri had the right idea initially. There was absolutely no reason to try and declare war on the humans. Blood for blood is a ridiculous way of thinking. If they had it their way they would have killed someone similar to Todd. An innocent family man; just like their own. One of the heads started acting irrationally, inciting somewhat of a riot and clash between clans of their own and so they needed to stop it. Making an example of the other clan in such a way was unneeded, but not necessarily wrong. Their society would have collapsed upon itself if it had gone either route really. Yes, the Sar´Teri come across more as well-intentioned extremists than fascist thugs. Maybe “peacekeepers” isn´t just a euphemism. I don’t know why this really didn’t occur to me before, but I wonder why Selkie’s mom is/was a single mother (and also if she is still alive, since she left Sarnoth with Selkie). 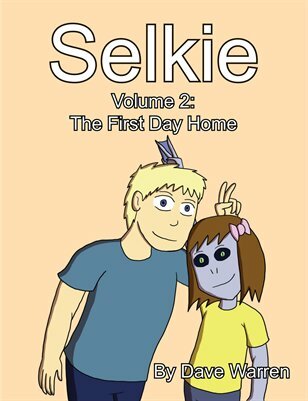 Given the fact that their family structures are similar to ours, I wonder if something happened to Selkie’s father? Or if he really wasn’t there to begin with. I think, “Well that escalated quickly” is appropriate. No matter how small Sarnoth might be when compared to the continental U.S., I have the feeling they still might have taken us. Remember, the British Isles are only a little larger than Wisconsin, but that didn’t stop them from carving out an empire that covered a quarter of the world. But British babies can breathe air. Also, we defeated the British. We know how to fight that kind of power. This kind of sounds like the Minbari civil war from Babylon 5. Ahh, civil complexities. Pohl was right about the clans. For those wondering why a clan of artists would respond so viscerally, I should point out that artists can be an emotional lot. Creative people often feel things intensely, it’s what drives us to express ourselves through creative acts. Conversely, lawkeepers must trend towards keeping a still and level perspective on things despite their emotive response. The two make a natural foil to one another you’d recognize in any sitcom with a zany roommate paired off with someone that wears dress shirts at home. …right down to the almighty rows over the organization of the fridge and that infinityforsaken line of tape. Or, if you like, the Spockfields and the McCoys without the mediating influence of the Kirks. I love the Spockfields and the McCoys. So Dave, have I said recently how much we all appreciate your excellent work? Oh don’t worry, I’d never flip out. …On you all. Hee hee:) I don’t think anyone’s mentioned but I wanted to say you are clever in how you are hiding this whole big reveal from Selkie, who may be a little too young for hearing it in the raw at this time when she’s getting her own special reveal. When he says the Jin’Sorai wanted blood for blood, does he mean that they wanted war against humans or that they wanted to demand that the fishermen be executed for murder? I would imagine the fishermen. I would hope just the fishermen. I don’t know why this feels so Harry Potter to me. I can’t help it. This brings me to a bit of curiosity, how do the Sarnothi communicate underwater? I mean up on land, our vocal cords resonate and the vibrations make sound in the air. Underwater, the only creatures humans know that can make sounds are also air breathers. If Sarnothi can breathe water, how would they communicate underwater with no air in their lungs/gills?